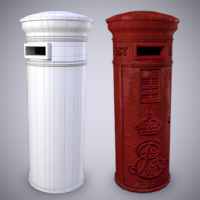 You'll Learn how to create a low poly, highly detailed, old UK post box in this series. As you Model, UVMap and Texture a model suitable for use in the game industry or as an environment filler for your scenes. You'll take a simple, straight forward, eye-balled approach to modeling and then dive into UVMapping and also learn how to create a highly detailed PSD network shader via Maya.